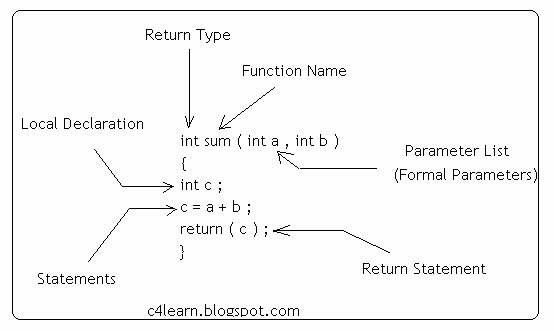 What is Function Definition in C Programming ? Function definition is nothing but actual Function. Function Call is short term used, however function definition is “Actual Broad Elaboration” of function call. Function definition is different from macro expansion. First Line is called as Function Header . Argument names has to specify here !! Return Type may be “Void” if function is not going to return a value. It is Unique Name that identifies function. All Variable naming conversions are applicable for declaring valid function name. Parameter injects external values into function on which function is going to operate. It is value returned by function upon termination. Function will not return a value if return-type is void.